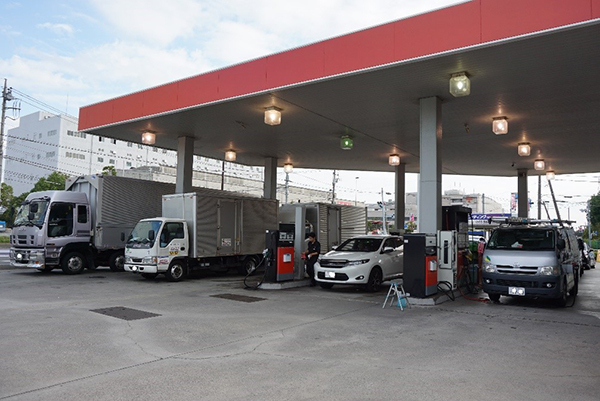 The quality of service customers receive at Japanese petrol filling stations is well-known. 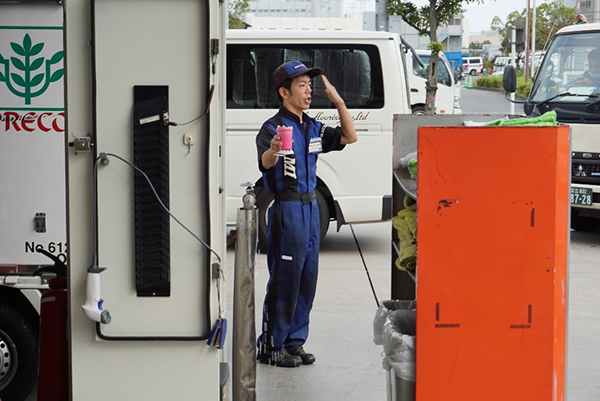 The attention to detail given by staff at the Higashi Nihon Usami Shin-kiba service station, near the start of Meiji-dori Avenue, exemplifies this image; this time in the way that cars are cleaned. 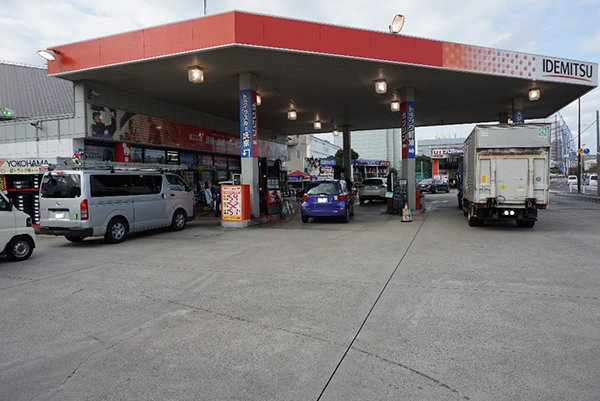 The Shin-kiba service station is a large and extremely busy site. It serves around 15,000 vehicles per month, as the station manager, Mr. Satoshi Kawane, explained when I managed to grab a few minutes of his time one afternoon. The service station stays open 24 hours a day and whilst many of its customers are car owners, the company especially caters to truck drivers in the distribution industry. Many of these drivers cover long distances across Japan delivering their cargoes. 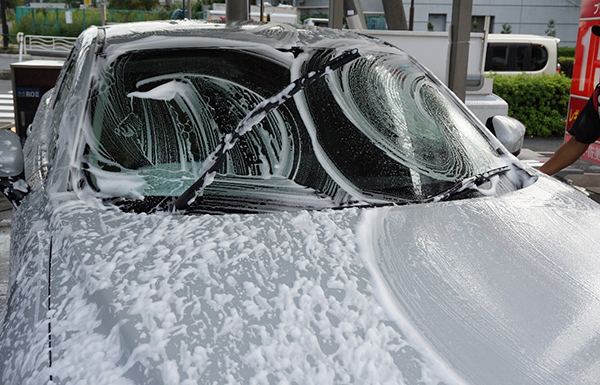 The service station offers them not only a place to park their lorries, but also provides a free shower allowing them to freshen up and wash off all those kilometres stuck behind the steering wheel. And in this age of rising petrol and diesel prices, combined with the growth of hybrid fuel cars, just selling petrol is not enough. 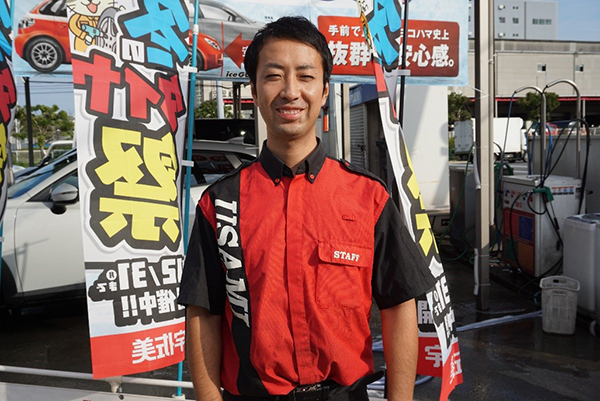 To differentiate itself, Usami Shin-kiba offers a quality car wash by hand. The basic service, priced at 2,200 yen and taking about 20 minutes, does not skimp on care and effort to deliver a sparkling clean car. and the rims of the car doors, the boot, and bonnet, are all carefully washed and wiped down. Nothing is over-looked; both the tyres and their trims are meticulously cleaned and wiped. The end result is the vehicle comes away looking spotless, as though straight off the assembly line. Mr. Kawane doesn’t stand by as his staff are hard at work; he has no hesitation in getting his hands dirty, or in this case, clean. According to him, the station has built up quite a reputation for its car wash service, and I can see why. 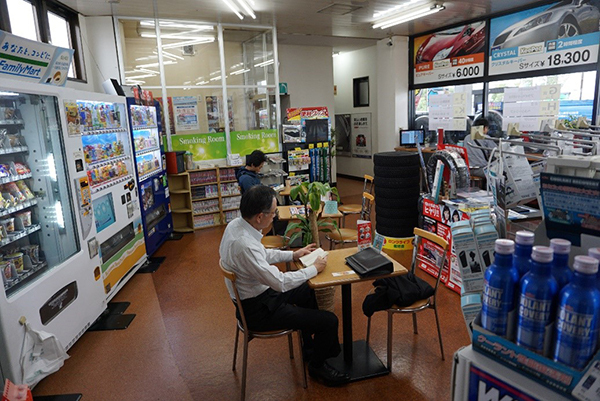 And whilst Mr. Kawane and his team are busy washing and polishing the car, its owner can relax in the reception area reading a magazine or helping himself or herself to coffee and snacks available for purchase. 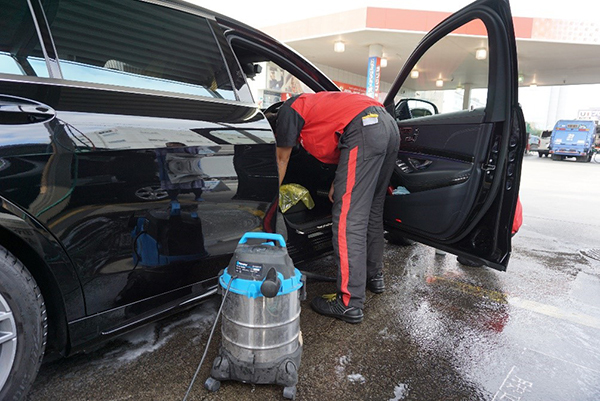 Of course, customers can also drive themselves through a self-service car wash machine on-site, but after seeing the attention and quality which goes into the hand wash service, why would they wish to? In another move away from relying solely on pumping petrol, Usami Shin-kiba acts as an agency for a car rental company, Carsta (Car Life Stadium). According to Mr. Kawane, the busiest time is at weekends when families rent a car to travel out of Tokyo. And just to make life that bit easier, customers can cycle to the service station to pick up the rental car and leave their bicycle there until they return. How about that for value-added service?